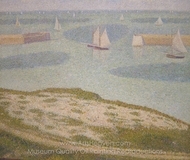 Georges Seurat paintings are some of the most fascinating created by any 19th century artist. 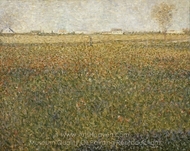 Born to a wealthy family in Paris, Seurat had an interest in art from an early age. However, long before he became known for his pointillism, Georges Seurat had great difficulty with the artistic establishment in his native France. Georges Seurat Impressionism simply could not find any place in Paris' prestigious art salons. Without the support of the Paris Salon and its middle class patrons -- that is, the bourgeoisie -- it was possible Georges Seurat paintings would never come to light. 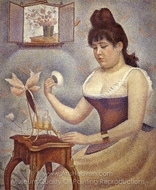 However, Seurat quickly found a place for himself among independent artists protesting the salons. 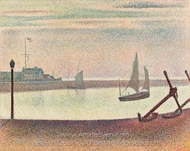 Georges Seurat paintings exist in two distinct styles, although arguably Georges Seurat pointillism paintings are an offshoot or expression of Georges Seurat Impressionism. 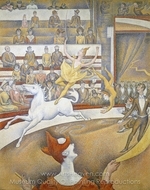 After breaking ranks with the likes of those associated with the Paris Salon, Seurat's work became more experimental. 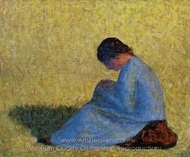 Soon, he was pioneering the new pointillism Georges Seurat is most commonly associated with. 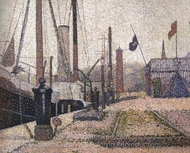 Pointillism, as the name implies, is a style of art that demands the use of tiny "points" of pigments. When the viewer stands very close to the painting, they can see that it is made up of these colored "dots." 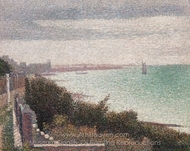 The pointillism Seurat mastered gives the viewer two ways to look at any given painting. 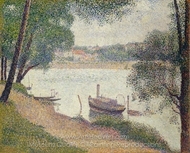 It is important to note that pointillism was a completely new creative endeavor, an artistic innovation provided by Seurat. His most famous painting of all, A Sunday Afternoon on the Island of La Grande Jatte, is the exemplar of the pointillist style. Despite the obvious complexity and challenge of the pointillist style, Seurat is able to create a magnificent impressionism work that provides an interplay of light and darkness as well as breathtaking perspective. Other paintings such as La Chahut, while less pronounced in their adherence to what we now think of as conventional pointillism, are remarkable in their continuing devotion to social commentary and their ability to evoke feeling through color and hue. 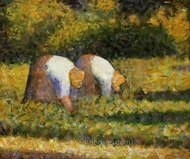 Many Georges Seurat pointillism paintings are extraordinarily colorful. Regardless of their subject matter, they can easily brighten up a room and make it appear bigger. 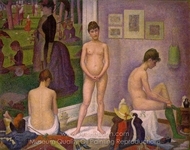 Displaying a Seurat painting higher in a room will open up a space, especially if there is an opportunity for the reproduction image to "play" with natural light from a window. However, it is a good idea to ensure your Georges Seurat pointillism paintings can be seen from many angles and distances, both close up and far away. 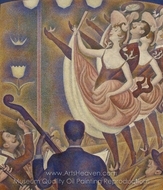 ArtsHeaven.com provides you with a brilliant reproduction that painstakingly recreates the rich colors making every single point of pigment a distinct part of a beloved Seurat composition.